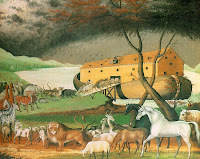 The environmental group, Greenpeace, is building a replica of Noah's Ark on Mt Ararat, the place where, according to the Bible, the big boat ran aground after the Great Flood began to subside. Greenpeace said it was to deliver the message that global warming is endangering the planet, which would get flooded if greenhouse gases like carbon dioxide, methane, and chlorofluorocarbons are not controlled. These gases trap heat in the atmosphere that causes ice in the polar regions to melt, potentially increasing sea levels and flooding coastal regions of landmasses. 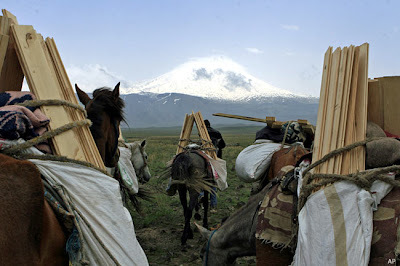 The picture shows horses carrying wooden planks to the mountain. Coincidentally, there are now two Noah movies coming soon. One is a sequel to Bruce Almighty and the other is a serious take on the Biblical character's life. For more on these, go the the archives of Hots Up.